We're still hoping for a dedicated Books app. It's official: With Windows 10’s Insider Preview Build 15014 for PCs and phones, Microsoft’s officially opened its ebook store, adding some nifty disk- and power-management features, too. Strategically, the ebook wing of Microsoft's Store app is probably the most important for the company. But you’ll probably get more out of the build’s ability to clean up your unused disk space, as well as balance the performance and power consumed by specific apps. Unfortunately, not all of you will be able to experience the new functionality quite yet. Why this matters: Microsoft’s Creators Update, due later this spring, will include this new ebooks capability as well as the other new utilities. By adding ebook capabilities, Microsoft's catching up more than anything else, but we’re still seeing a broad, diverse set of upgrades to Windows 10. Some of you will see this new Power setting on the Windows 10 Taskbar. 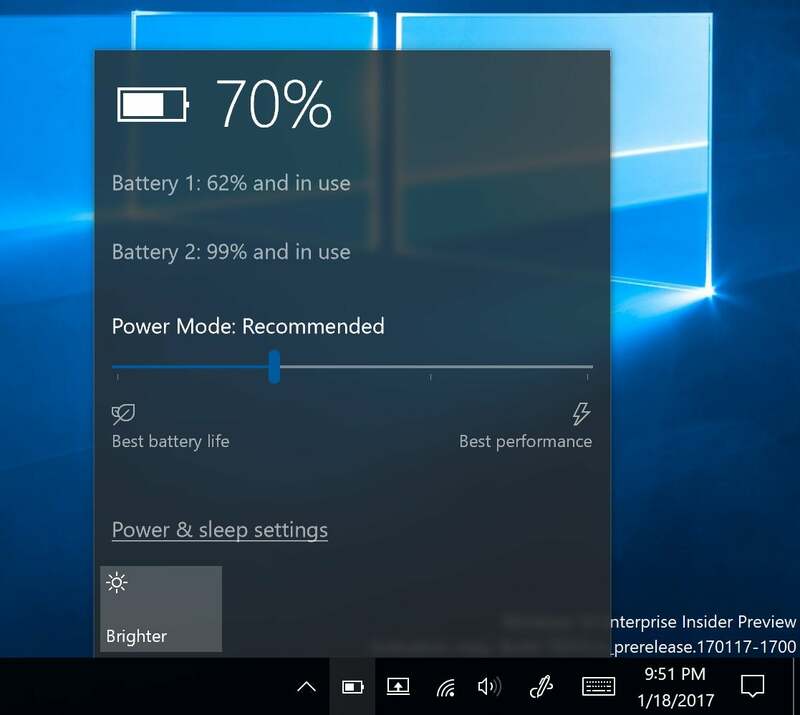 For years, Microsoft tucked away the option to reconfigure your PC’s “power plan” within the Control Panel, allowing you to select between a “balanced” plan that prioritized your PCs’s performance and battery life about equally, or adjusted it to maximize battery life or performance. But this control (Control Panel > Hardware & Sound > Power Options) melted into the background as Windows 10’s Settings became the front page of your PC’s under-the-hood controls. Now, Microsoft’s brought it front and center inside Windows 10’s Taskbar. Microsoft’s other useful utility is what it calls “automatically clean up space:” a new option in Settings > System > Storage Settings that will automatically hunt down and delete temporary system files and files that have been kept in the Recycle Bin for over 30 days. The option is off by default, but it might turn out to be a handy way of clearing clutter in your PC. As we’ve noted before, Microsoft's playing catch-up with Amazon and other digital booksellers. Instead of adding a dedicated Books app, though, Microsoft is going to use Edge, treating a downloadable ebook like a Web page stored in Edge’s Reading List, for example. PDF and EPUB formats will be supported. Microsoft has launched its new eBooks portion of its store within Build 15014 of Windows 10. Once you purchase a book from the Store, it will be stored in the Books portion of Edge. There, you’ll be able to take advantage of Edge’s configuration options, including Cortana. Microsoft says you’ll be able to use Cortana to define words and gain additional context, view embedded video (if your ebook includes it) and change the font and font size. Importantly, you’ll be able to pick up where you left off and add bookmarks, too. Build 15014 also introduces several new configuration options: the ability for PC users to pick their own custom accent colors, as well as some visual tweaks that will make the Cortana search bar stand out, match the accent color, and display notifications more prominently. 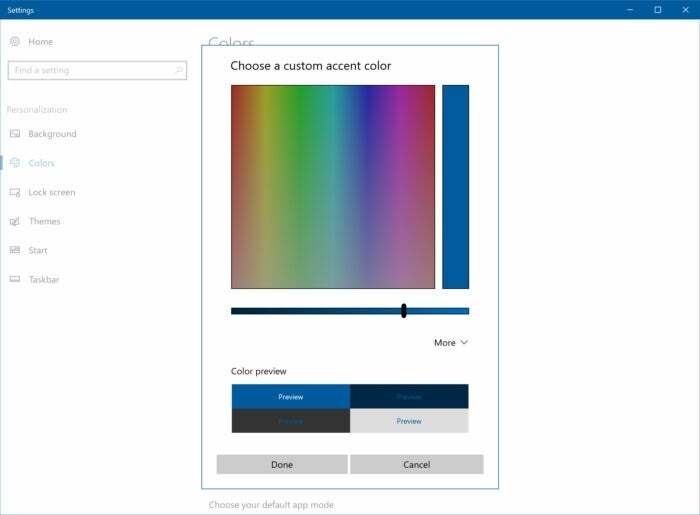 New accent color options arrive with Build 15014. Windows’s Mail app will receive an upgrade of sorts; Windows will now pin it to the Taskbar by default. The Snipping Tool also received an update, Microsoft said. Usually, when Microsoft adds a slew of new features, things break. This is still the case, beginning with the progress indicator to download the new build: It doesn’t work, and it may look like the new build isn’t downloading at all. “Ignore the indicator and be patient,” Microsoft said in a blog post. After updating, Microsoft also warned that execptions in the Spectrum.exe service could cause PCs to lose audio, disk I/O usage to spike,and Edge to become unresponsive. If that happens, Microsoft suggests you check this post for more details. Finally, a storport.sys bug may trigger the new Green Screen of Death and may roll back to the earlier build—bad luck that Microsoft currently can’t fix. Microsoft also said that it would kill its MyPeople app, the "People Hub" that was one of the features of the Creators Update. Microsoft has pushed the feature back by one release, the company said. Updated at 10:33 AM on Jan. 20 with MyPeople details.